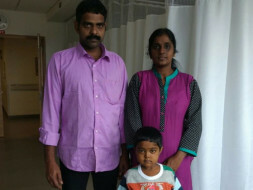 6-Year-Old Akhina from Trivandrum is diagnosed with Auto Immune Liver Cirrhosis. She is suffering from this disease from the age of 3. Her parents, Binil Kumar and Nishakumari, found out of their daughter's disease when Akhina fell ill with pneumonia. It was during one of the tests, that they knew that about her liver disease. Akhina's father is a painter and earns less than Rs.500 a day. There are days when there is no work and he is left without the money for the day. Nishakumari is a homemaker. With the help of their relatives and friends, Binil Kumar collected close to 2 lakhs for the transplant but they need over 10 lakhs for the transplant. 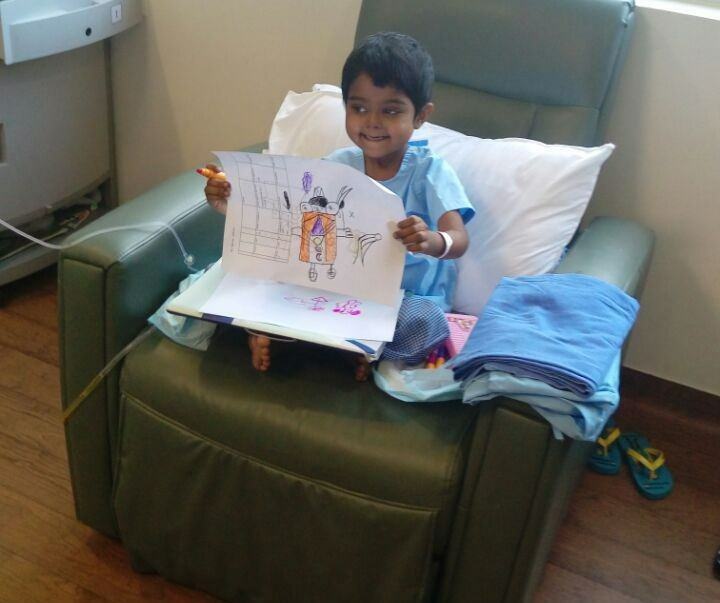 Akhina is undergoing treatment at Aster Medcity Hospital, Kochi. Doctors have recommended a liver transplant to save her. 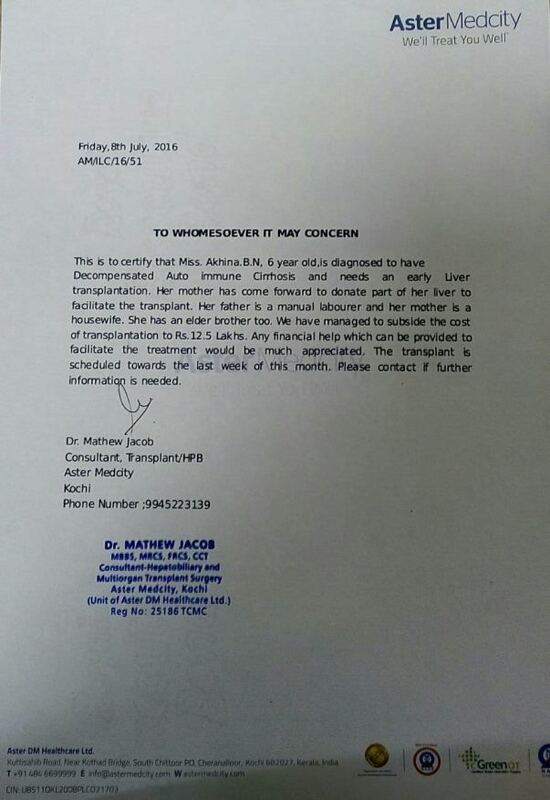 Her mother has come forward to donate a part of her liver to save little Akhina. Akhina's disease is a unique and complex disease. She needs help immediately. Akhina can start the treatment procedures for the transplant if the family can arrange the funds. Her transplant is scheduled for the end of July and Akhina's family has few days left to take her to the hospital in Kochi. Your contribution will bring Akhina one step to closer to getting her transplant and recovering from the disease that is affecting her. Thank you all for the support. Akhina is doing well now. She is discharged from the hospital and is now living with her mom at a rented place nearby. She can go home to her family in a couple of weeks and follow up from there. I will keep you posted on her progress in the days to come. Akhina is doing well except for some chest infection. She will be shifted from the ICU once she gets free from infections. Her mother has moved to a rented house near the hospital. She is recovering well. Akhina drew a picture for us today. It is really great to see her active with her sweet smile. We will keep you posted on her progress. Akhina's transplant was successfully completed on Wednesday. The surgery went on for nearly 12 hours. She is off the ventilator and is doing well. Her new liver is working well. Akhina's mother who was the liver donor is doing well and will be on strict diet for the next few days. Thank you all for this overwhelming support. We were able to perform her transplant as planned because of your timely support. We will keep you posted on Akhina's progress. I would prefer to be annonymous.